A very special new year eve celebrated in Trader's Hotel with a group of friends from every places. I met a few new friends, Asahar, Kuni and Gary, friends of Laurie, they are so fun to chat with. 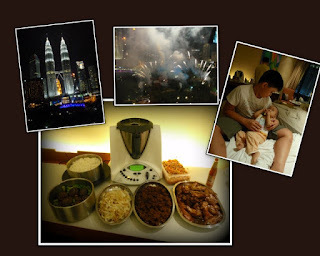 Laurie booked this room a year ago, KLCC view, fantastic fireworks view, we saw fireworks right in front of us, it was an unforgeable experience for both Gab and I. Most of all, Gideon bought ThermoMix to cook us a super delicious dinner, from starter, main course to desert, I was so amazed by this Super Chef - ThermoMix could done, after all the cooking, no smell of oiliness, no smoky air, no sticky table, yet it could blend, it grinds, it cooks, it boils, not only gives us a delicious dinner as well as healthy food. Thanks to Gideon for all his heart (hard) work.